New for 2018, The Jensie Gran Fondo will feature timed segment racing. This competitive format is an integral component of all Gran Fondo National Series events. If you are new to timed segment racing, here is some important information about how it works. All riders will get a timing chip that attaches to your bike. Instead of timing the ride from start-to-finish, only your segment times count. The Breakaway route has one timed segment, the Presidential route has two, and the Shut Up Legs route has three segments. At the end of the event, your age group and overall ranking is determined by your combined time through the designated segment or segments on your route. You must cross the finish line in Stafford Lake Park for your segment times to be counted, but the first rider to arrive at the finish line is not necessarily the winner of the competition. Are the miles between segments timed? No. The miles before and after segments are not timed. You are free to ride the entire route at your preferred pace, but there is no advantage to surging ahead of the pack to be the first rider to reach a timed segment. Only the time from the beginning to end of the segment counts toward the competition. In other words, you could go slow or stop between timed segments and it won’t change your standing in the competition. What is the advantage of timed segment racing? In traditional road racing and gran fondos, getting dropped or having a mechanical that takes you out of the lead group means your race is over. With timed segment racing everyone has a chance to compete, no matter if you’re riding at the front of the lead pack, far behind in a smaller group, or all by yourself. Regroup with your friends. Between timed segments you can slow down, stop at aid stations, and regroup with friends you want to ride with. New competitive strategies. Because you can regroup and recover with friends and teammates between timed segments, riding your rivals off your wheel early in the day may not be a smart move. Some timed segments are climbs, but others are rolling sections of road that reward teamwork. Is the road closed to cars in timed segments? No. However, timed segments are set up on stretches of road where there are few or no intersections, and where intersections can be controlled by law enforcement to give riders the right of way. Rules of the road still apply (i.e. you cannot cross the center line) and all riders should be aware of their surroundings and take care at all intersections. How will I know where the timed segments are? There will be signage on the course notifying you that a timed segment is coming up. At the start of the timed segment, you will cross a visible timing sensor on the road. 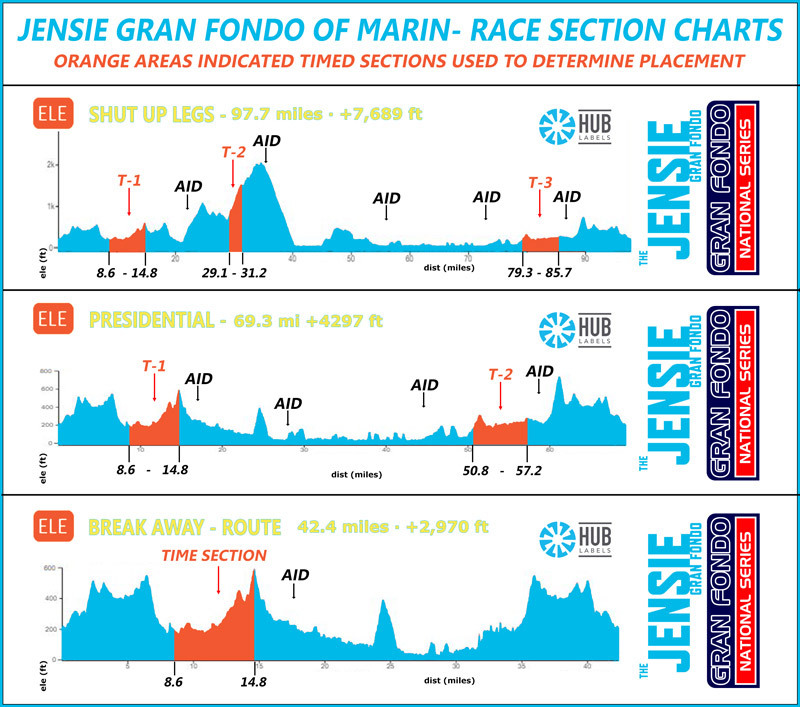 The map below shows the timed segments on each of the three Jensie Gran Fondo routes. Do I need a license to participate? No, You do not need a special license to be included in the competition. You can choose to ride the timed segments at any pace your choose. Your times will be recorded, but as with any timed cycling event, there is no obligation to compete.